Kitty Raises Hell picks up with Kitty and new husband Ben back in Denver, after their caper in Las Vegas. They’re going on with their lives, when the word “Tiamet” shows up, burned into their restaurant New Moon. 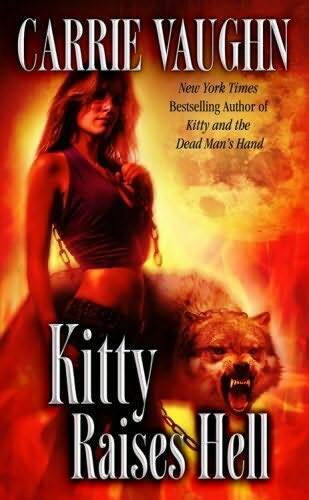 Of course, Tiamet is the cult Balthasar and his were-cat buddies were part of in Kitty and the Dead Man’s Hand. Their problems in Vegas didn’t stay in Vegas. While running with the pack that full moon, Kitty and her fellow wolves notice a malevolent force. It has the smell of fire and brimstone. One of the wolves is threatened and almost hurt. In the meantime, a group of paranormal investigators have come to town and Kitty takes an interest. She tags along as the team checks out a suspected haunted house. But the van where Kitty and the trio are set-up outside the house is attacked. They pick up the scent of fire and brimstone, just like during the run. And Kitty realizes she’s the target. Kitty teams up with the paranormal investigators and reaches out to Grant, the mysterious magician she met in Las Vegas. They’re all trying to figure out what exactly they’re dealing with. To complicate matters further, Roman, an unusual vampire, comes forward, offering to help fight off the threat, in exchange for safe passage in Denver. There are plenty of twists and turns in the mystery. And we get to know two characters that will make return appearances in later books: Roman and Tina, the psychic. We also see Kitty and Ben grow stronger as a couple. I can’t say they’re very exciting together. But at least Kitty feels safe with him. And he’s a good guy, his blandness notwithstanding. I liked it better than the last book. 4 1/2 stars. I LOVED this one!! I have been devouring the Kitty books all week. I know that Ben is boring, and my friend is irritated with him that he butted in between her and someone else — but he’s so good for her. Carrie Vaughn does such a good job at endearing him to me and the way the two are together, it’s just tense because I feel like we all know what’s going to happen when the OTHER guy eventually gets out of the slammer. I just hate anticipating possible heartache! AAAAAAHHHHHHH.